SPRO Squidtail Jigs were designed to mimic all sorts of prey including baitfish and squid. The lifelike action of the soft plastic squid tail attracts all types of gamefish. - Select Option -1/4 oz.3/8 oz.1/2 oz.3/4 oz.1 oz.2 oz.3 oz. SPRO Squidtail Jigs were designed to mimic all sorts of prey including baitfish and squid. The lifelike action of the soft plastic squid tail attracts all types of gamefish. 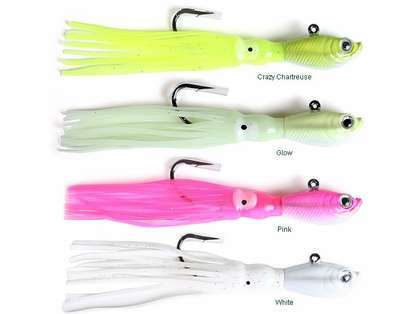 SPRO Squid Tails are available in different weights and colors for just about any fishing situation. SPRO Squid Tails also feature a custom designed Gamakatsu 3x strong hook for sharpness and strength. Standby jig for black seabass. Chartreuse or the sand eel olive/green have been staples. Can't go wrong with a white spro. The squidtail has a nice action that fish are attracted to. If I could only use one color, it would be white. These squid tail jigs are excellent for fluking in the bay and nice days in the ocean. Add some plastic to the hook and you are ready for some flatties! I used this a few times for fluke but no luck. Hopefully as the season heats up I will land a nice fluke on it!! Mackerel love the bucktail version of this jig and the squidtail is no different. I use it as a pitch bait when I see surface action. ProsThe glow color is great for the pre-dawn fishing action. very effective and sharp hook. it works very well and fish love it. The Spro Squidtail lure is a very effective lure. I tip ip with a strip of squid and fish go nuts!